Fred and Heffe are joined by Fortengard and the discussion focuses heavily on recent Japanese releases Yakuza Zero, Final Fantasy Type-0, and then quickly move to Bloodbourne and Dark Souls. Eventually the guys get to news, but the alcohol is flowing and technical difficulties continue to get the best of us. We so very often recommend our listeners/viewers/readers get a foreign PSN because it’s so “easy”, but I figured with this morning’s news of Shadow Tower coming to the US PSN later today and the massive amount of games I purchase on the various PSN stores that it was high time to make it easy for you. Creating a PSN is not a difficult task, however it can be a challenge without knowing the language, written or otherwise, of the territory you seek and also knowing what you will and won’t gain from each. With the average Playstation 3 being able to tether up to 5 PSN accounts, I have chosen to dedicate one to my home base PSN, three to outside territories, and the final one to guests in my house. The best benefit of a PSN account on multiple consoles is that all accounts on that console can share installed games, so I purchase a game on my Japanese PSN only to use it on my American account for the sake of trophies and keeping my friends informed as to what I’m playing. Perhaps you don’t know how to create a PSN for another country or perhaps you don’t know the benefits, well this little article will assist you in making the proper decision. Want to trace the origins of where Bloodborne and the Souls series came from? Then be sure to pick up this PSone classic which is due out today: Shadow Tower. It is a first person adventure game from the developer From Software back when people knew very little about the company (with maybe the exception of the Tenchu series). This is a game that many listeners of GH101 have asked if Fred or myself will cover. Now that it is finally coming to PSN I’ll be sure to pick the game up and give it a go (so will I, especially with Vita support – Fred). As far as I am aware this is only coming to the US PSN store but setting up a US account is very simple. There are also many other great PSone classic in the US store not available in other territories. Normally we focus on retro here at Gaming History 101, but I don’t think it’s ideal or responsible to ignore the present either. Despite the handful of modern reviews and the potential plan to re-introduce the Gaming History X podcast, I still think the strength of our site is to remain retro focused. I still get psyched waiting for E3, seeing the new hardware and software on the market, and reflecting on things to come. Right now is a weird time for console gaming. The PC trumps the consoles yet again but I feel this time around there was never a loss of momentum for the complicated pseudo console that has been the PC and from the time of the PS4 and XB1’s release that gap has only grown wider. Meanwhile Nintendo is this awkward dichotomy of complete control over the handheld market and a niche presence on consoles and some disturbing trends that are exploiting retro fans are emerging. When you suddenly see the cooperative gaming development, media, and zeitgeist all get together and remember the games of the past to provoke interest, those of us that never forgot may be tempted to get a bit elitist and a bit resentful. I personally took issue with the concepts of Gex suddenly entering the world of big press podcasts, the fact that IGN is desperately seeking to keep hold of its massive audience while juggling the departure of major talent and the lack of regular game releases of note, and don’t get me started on the people that just plain like to generate revenue on playing emulated games completely without context and making fart jokes over them. Then I realized I have no reason to care. Let everyone do what they want to do, besides I’ve always conceded that retro content is something to be shared and not competed against. Just as there will be indies who give content away for free to the enjoyment of all, there will also be businesses attempting to make a quick buck off of it. Since we here at Gaming History 101 have no ads, no income, and are not a business, we are in the unique position to have, literally, nothing to lose. With that in mind I would like to take our retro context and take a look at the state of gaming – consoles, PCs, handheld, mobile, and potentially VR – and give a quick oversight as we approach the 90 day mark to E3. As some of you may know, the Gaming History 101 podcast is featured live on Tuesday nights at 7:00 pm Eastern on the All Games Radio Network. Within that network there is an interesting show called Mom’s Minute that features All Games Editor-in-Chief Derrick Hopkins’ mother discussing video games and she recently took an interview with Mike Kennedy regarding his upcoming console. You should listen to the interview itself, but it looks like it will be a retro-based cartridge console in an Atari Jaguar shell with no operating system and purely a modern take on the classic cartridge console. With some clear plans, a shorter window (60-90 days), a good initial price point, and a vision hopefully there’s something to Kennedy’s plans. We highly recommend giving this episode and interview a listen. To wrap up our Resident Evil/Silent Hill series (for a while at least), the GH101 team (with special guest Vos) dive into Silent Hill 4: The Room and Resident Evil: Code Veronica. Oddly enough, while SH4 has often been regarded as not originally part of the franchise, it turns out it was always a Silent Hill game and developed by Team Silent but it is a different experience when compared to the games before it. In contrast, Resident Evil: Code Veronica was originally to be Resident Evil 3 and marks the ultimate form of what originally began with the traditional feel and “tank controls”. Fred, Jam, and Vos break down each game and what makes them significant iterations in each series. These days there is a good chance any gamer is familiar with the “twin stick shooter”, a concept where you move with the left stick and shoot with the right. Back in 1982 when fantastic game designer Eugene Jarvis premiered the concept in Robotron: 2084, it was unlike anything we had ever seen. The merits of that game, and what it brought to video games, cannot be denied and if you want an idea of how Robotron played you need look no further than recent neo-retro release Rock Boshers Dx. 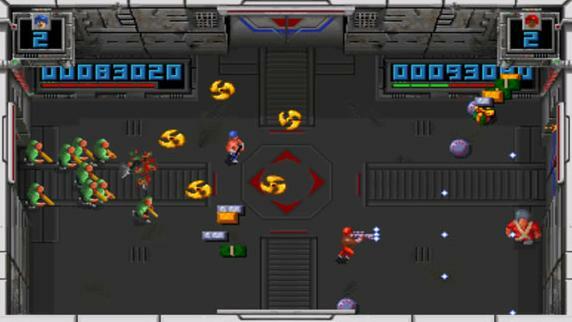 It wasn’t until almost a decade later, in 1990’s fantastic Smash TV, that Jarvis along with a talented team at Williams created one of the most addicting arcade games from my youth. 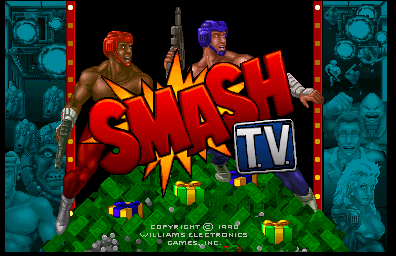 Set in the year 1999 – oh how we thought so much was going to change with the year 2000 back then – Smash TV has you and potentially one other person shooting it out in a room-to-room TV studio playing the most violent game show of all time (Running Man anyone?). It takes the building blocks of Robotron: 2084 and brings it into the nineties by giving you a second player, having you kill tons of humans instead of rescue them like in Robotron, and of course you’re doing it all for cash prizes to selfishly grow your wealth. I loved it then and I love it now. It’s now time to wrap up that epic quest and prepare for the last 11 months of subscription fees you’ll be giving Square for these versions because as of March 2016 the servers are shutting down. Final Fantasy XI is one of the two examples of Massive Multiplayer Online (MMO) iterations to the long running RPG series from Square Enix. It’s a bit more pivotal than it’s younger brother, Final Fantasy XIV (A Realm Reborn) in that it launched as a console MMORPG in a time where games weren’t predominantly online and MMOs were unanimously locked to the PC platform. This console only PS2 and later Xbox 360 game had quite literally hundreds of hours of content, always maintained a monthly service fee, and hopefully someday will be the premise where guests Chip (CaptinChaos) Cell and Eli (Sodoom) join us for an extra credit podcast about their addiction to the game. It should be noted that a PC version of the game does exist, and to my knowledge it will continue, and that it was available approximately six months after the release of the PS2 version in 2002 (just covering my bases). In an interesting side note, Square Enix also announced that it is working with mobile developer Nexon Korea to port the game to mobile platforms. No information was given on pricing of the base game in addition to pricing of monthly service or if there will even be such a charge. It is slated for a 2016 release in Japan, Korea, Europe, and North America. Here at GH101 we have a new experiment: give someone the task to grab us three games on a budget and we have to cover them over the next month. Today is Jam’s unboxing, tomorrow is Fred’s. Over the course of April, both of us are being tasked to cover these games as if they were selected content for the site. This can be podcasts of the series these games are a part of, playthrough footage, articles, or the obvious review approach, are all on the table. Stay tuned and enjoy Jam’s unboxing below.